When You’re Alone as a Kid Trailer: IT! IT – Bill Skarsgård as Pennywise – Photo by Brooke Palmer/Courtesy of New Line Cinema. The first trailer for New Line Cinema’s IT – based on the Stephen King bestseller – builds an atmosphere of grim foreboding. IT will premiere on September 8th. Creepy Clown Trailer: Stephen King’s IT! The first trailer for Stephen King’s IT has arrived and it’s really, really creepy (yay scary clowns!). The story of four boys who have to take on Pennywise – a clown who has been killing centuries – is pretty compelling stuff (to be watched between one’s fingers – preferably during the daylight hours. Directed by Andy Muschietti (Mama), It opens on September 8th. Bill SkarsgårdItJaeden LieberherMovie TrailersNew Line CinemaStephen KingWarner Bros.
Bill Murray Makes St. Vincent More! 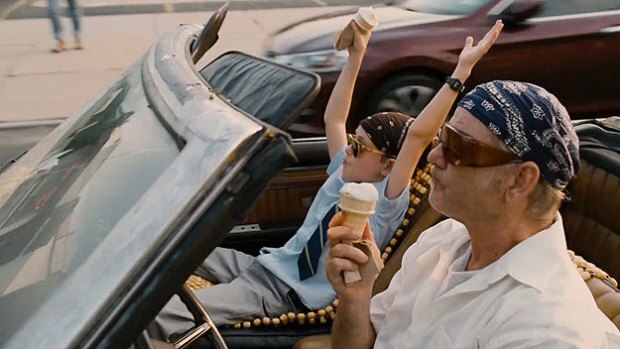 St. Vincent is a film that tells a story that we’ve seen many times before – a curmudgeonly older guy rediscovers life because of the influence of a child, while teaching that child about life. The difference between St. Vincent and those many other similarly plotting movies is that this film has a cast that includes Bill Murray.